CTSA director honoured as "one of Africa's most dynamic and innovative leaders"
Shaun Uys, managing director of Continental Tyre South Africa (CTSA), has been honoured as one of Africa's most dynamic and innovative leaders by UK-based CEO Today magazine. "Dedicated to recognising strong and innovative leadership amongst business leaders operating in Africa, across all key business sectors and industries, the CEO Today Africa Awards recognise and celebrate outstanding leadership, superb strategic thinking and entrepreneurial spirit," the publication states. Editor-in-chief, Mark Palmer commented: "It is vital for every business striving for success to have a leader whose diligence, innovative thinking and ingenuity inspire their team to demonstrate the same qualities and achieve excellence. We are happy that all of the individuals listed within the CEO Today Africa Awards are corporate leaders who aspire to these qualities and whose enthusiasm and hard work help their companies successfully accomplish their goals." According to the magazine, its research department spent several months carefully researching and identifying some of the most hard-working, ambitious and forward-thinking CEOs in Africa today. "It is an honour and privilege to receive this award, which celebrates the success of Continental Tyre South Africa. It's a tribute to all our employees that have helped develop and grow the business in recent years," said Uys, who was appointed managing director of the Port Elizabeth-based operation in 2015. "This isn't an individual effort, but is driven by the dedicated and committed team that I work with daily, who have played a key role in taking CTSA forward with networks and partnerships in over 30 countries in Africa." One of the company's most significant ventures was the launch of Continental Tyre West Africa in Ghana during 2016. "Expansion into the crucial Sub-Saharan Africa markets, and West Africa in particular, is a fundamental part of our long-term growth strategy and expanding our footprint across the continent," Uys commented. 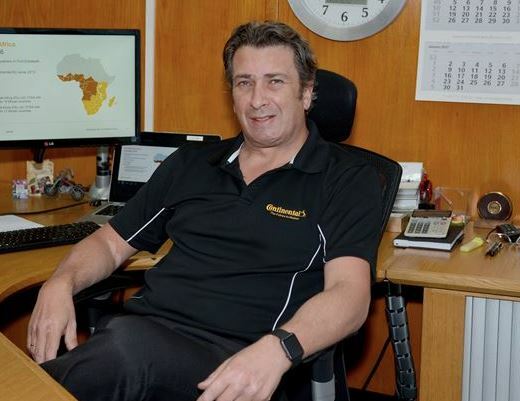 Uys joined Continental in 2000 as a Production Area Manager at the Port Elizabeth plant. Since then, he has held various positions within the organization, both locally and globally, including Head of Pricing Truck Tyres; Marketing and Sales in Hanover, Germany; and Sales Director, NAFTA replacement Truck Tyre business, Marketing and Sales in Charlotte, USA. On his return to South Africa, Uys was appointed as Project Manager to implement a tyre retail organisation for the ContiTrade division, before taking up the role of General Manager, Sales and Marketing in 2012 and Managing Director in 2015. Uys began his career after he graduated from the Port Elizabeth Technikon, now known as Nelson Mandela University, with a Diploma in Mechanical Engineering. He furthered his studies at the University of South Africa, where he graduated with a Bachelor of Commerce, which ignited his passion for sales and marketing. Structure of SA MBR sector to "change dramatically"